Sunday September 29th 1901 Ida was nearly sick today but helped some with the work. Mother & Ott were here for supper Frank brought Mollie back and was here to supper too. I read a little in the evening, wrote to Laura Shurts. 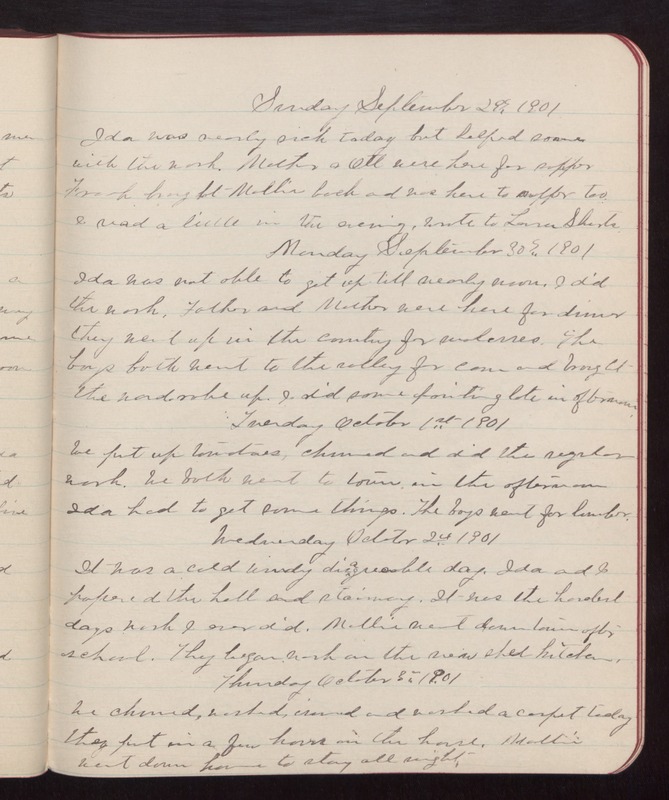 Monday September 30th 1901 Ida was not able to get up till nearly noon. I did the work. Father and Mother were here for dinner they went up in the country for molasses. The boys both went to the valley for corn and brought the wardrobe up. I did some painting late in afternoon. Tuesday October 1st 1901 We put up tomatoes, churned and did the regular work. We both went to town in the afternoon. Ida had to get some things. The boys went for lumber. Wednesday October 2nd 1901 It was a cold windy disagreeable day. Ida and I papered the hall and stairway. It was the hardest days work I ever did. Mollie went down town after school. They began work on the new shed kitchen. Thursday October 3rd 1901 We churned, washed, ironed and washed a carpet today. They put in a few hours on the house. Mollie went down home to stay all night.